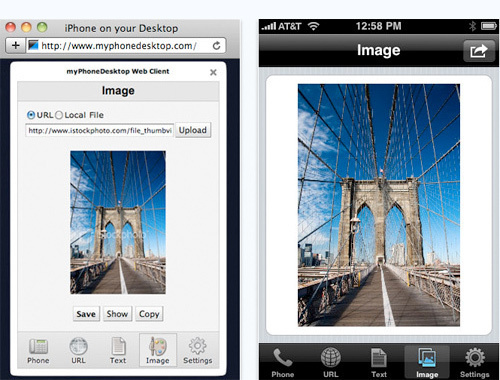 MyPhoneDesktop allows you to send anything you can copy to your clipboard on your PC or Mac to your iPhone and iPad instantly over 3G or WiFi. This includes phone numbers, text, URLS, images, and more. This app provides seamlessly integration between your iDevice and computer by allowing you to take advantage of your PC’s full size keyboard and screen and the mobility of your iPhone or iPad without interrupting your workflow. For example, transitioning your workflow from your desktop PC or laptop to your mobile device is usually quite frustrating. If you come across a phone number online, for instance, you would have to manually type of the number into your phone. 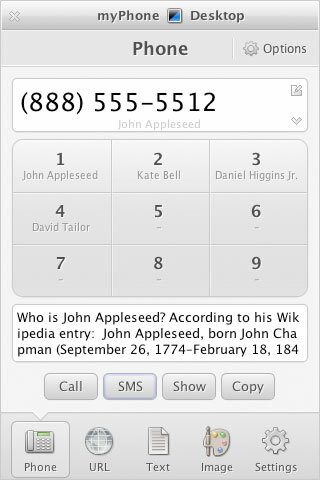 However, with the MyPhoneDesktop application you can instantly dial the number on your iPhone by simply copying the number to your clipboard on your PC. Download the MyPhoneDesktop app and desktop client. Currently the developers provide desktop clients to work with their iPhone/iPad app for Linux, Windows, and OS X based machines.